These beautiful forks are 6 1/4" long. Total weight is 72.9 grams or 2.3 Ozs. Troy. Arts & Crafts hard to find three piece youth set by the masters Omar Ramsden & Alwyn Carr, hallmarked for London 1908. The most important work of Omar Ramsden is during his partnership with Alwyn Carr (Jacksons Pge 73 Pocket edition), the flatware has a hammered finish. 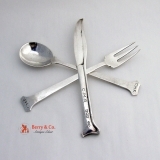 The set is: the knife is 6 3/4" long, the fork is 6 7/8" long, the spoon is 6 7/8" long, total silver weight is 146 grams or 4.7 ozs Troy, each piece is monogrammed CMR in a period script. The excellent original condition and clear, crisp detail, with no removals, repairs or alterations, make this an especially attractive offering. The soft, warm, original finish is present, with no buffing or machine polishing. 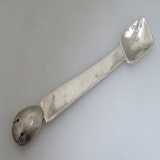 Mexican sterling silver tea caddy spoon by William Spratling, 1st design period, 1933 - 1938. 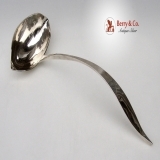 TAXCO, WS 925 This handsome hand made and hammered spoon is 3 7/8" long and weighs 22 grams. Excellent original estate condition and clear, crisp detail, with no monograms, removals, repairs or alterations, make this an especially attractive offering. The soft, warm, original finish is present, with no buffing or machine polishing. 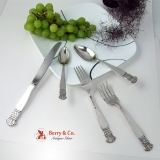 American sterling silver hand wrought flatware set in the Grenada pattern by Old Newbury Crafters, 1960. 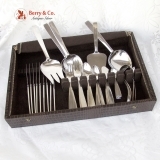 The set consists of: 8 Knives 9" long, 8 Forks 7 1/2" long, 8 Salad Forks 7" long, 8 Teaspoons 6" long, 8 Dessert or Oval Soup Spoons 7 1/8" long, Total silver weight is 67 ozs Troy. The soft, warm, original finish is present, with no buffing or machine polishing. The excellent original condition and clear, crisp detail, with no monograms, removals, repairs or alterations, make this an especially attractive offering. 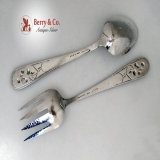 Danish sterling silver set of 8 Lobster forks in the Acorn pattern by Georg Jensen. 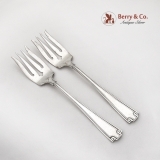 These elegant forks are 7 3/8" long and weigh a total of 276 grams or 8.9 ozs Troy. The excellent original condition and clear, crisp detail, with no monograms, removals, repairs or alterations, make this an especially attractive offering. 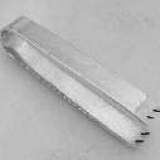 American Arts and Crafts hand made hand hammered sandwich or asparagus tongs in the Swedish Modern pattern by Allan Adler Silversmiths of Los Angeles, c.1960. 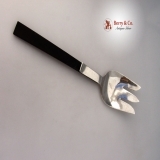 These special hand made tongs are 7 3/4" long, with flat bowls 2 3/4" wide and 2 1/2" long. The tongs weigh 181 grams or 5.8 ozs. Troy. The soft, warm, original finish is present, with no buffing or machine polishing. The excellent original condition and clear, crisp detail, with no monograms, removals, repairs or alterations, make this an especially attractive offering. American sterling silver hand made and hammered serving spoon in a fiddle pattern, c.1920 - 1950, maker′s mark: G-C HAND-MADE STERLING. 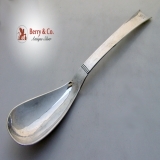 Absolutely the best Anonymous spoon we have offered, this interesting and extremely well crafted serving spoon has its overall original hammered finish and is 101/4" long, weighing 95 grams or 3 ozs. Troy. The unusual bowl is 3 1/2" long and 1 3/4" wide. The soft, warm, original finish is present, with no buffing or machine polishing. The excellent original condition and clear, crisp detail, with no monograms, removals, repairs or alterations, make this an especially attractive offering. American sterling silver fish serving set in the Norman Hammered pattern by Shreve and Company of San Francisco, c.1915. This handsome and heavy set consists of: Serving Fork 10 1/8" long weighing 146 grams Serving Knife 11 5/8" long weighing 166 grams Total weight 312 grams or 10 ozs. Troy, with the hammered finish being in excellent condition. Each has an unusual, period Arts and Crafts Style monogram: G. Monogrammed as described above, the soft, warm, original finish is present, with no buffing or machine polishing. The excellent original condition and clear detail, with no removals, repairs or alterations, make this an especially attractive offering. 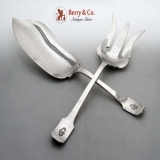 American sterling silver asparagus serving fork in the Norman Hammered pattern by Shreve and Company of San Francisco, c.1915. 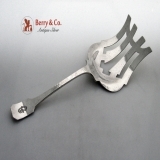 This handsome and heavy serving fork is 10 1/8" long and weighs 139 grams or 4.5 ozs. Troy. The front of the handle has an unusual, period Arts and Crafts style monogram: G and the hammered finish is in excellent condition. Monogrammed as described above, the soft, warm, original finish is present, with no buffing or machine polishing. The excellent original condition and clear detail, with no removals, repairs or alterations, make this an especially attractive offering. 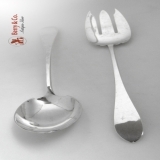 American sterling silver fish or large salad forks 12 in the Norman Hammered pattern by Shreve and Company. c.1915. 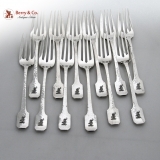 The hammered finish is in excellent condition and each fork has an applied period monogram: F. Each of these forks is 7 1/8" long and the twelve weigh a total of 690 grams or 22.2 ozs. Troy. Monogrammed as described above, the soft, warm, original finish is present, with no buffing or machine polishing. The excellent original condition and clear detail, with no removals, repairs or alterations, make this an especially attractive offering. 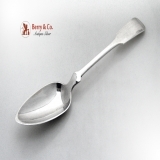 American sterling silver Arts & Crafts large serving spoon by Peterson, c.1940. 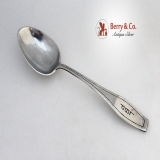 This handsome spoon is 11 5/8" long and weighs 133 grams or 4.3 ozs Troy. The excellent original condition with no monograms or removals, repairs or alterations, make this an especially attractive offering. American Art Moderne large punch ladle, Portet Blanchard, unmarked. This magnificent ladle is 16 inches long and weighs 436 grams or 14 ozs Troy. The excellent original condition and clear detail, with no monograms or removals, repairs or alterations, make this an especially attractive offering. 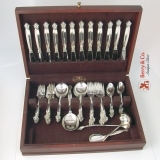 Danish sterling silver salad serving set by Georg Jensen in the number 57 pattern, with the old GJ mark used from 1933 - 1945 This handsome set is 8 3/4" long and weighs a total for 183 grams or 5.9 ozs Troy. The soft, warm, original finish is present, with no buffing or machine polishing. The excellent original condition and clear, crisp detail, with no monograms, removals, repairs or alterations, make this an especially attractive offering. American sterling silver Arts And Crafts fish serving set in the Norman Hammered pattern by Shreve & Co, 1909. This handsome, heavy set weighs 269 grams or 8.6 ozs Troy. The soft, warm, original finish is present, with no buffing or machine polishing. The excellent original condition and clear, crisp detail, there is a cutout monogram L, no removals, repairs or alterations, make this an especially attractive offering. 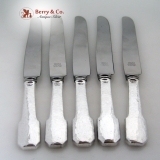 American sterling silver Arts And Crafts set of 5 dinner knives in the Norman Hammered pattern by Shreve & Co, 1909. These handsome knives are 9 1/4" long. The soft, warm, original finish is present, with no buffing or machine polishing. American sterling silver Arts And Crafts set of 14 teaspoons in the Norman Hammered pattern by Shreve & Co, 1909. These handsome spoons are 5 7/8" long and weigh a total of 475 grams or 15.3 ozs Troy. The soft, warm, original finish is present, with no buffing or machine polishing. 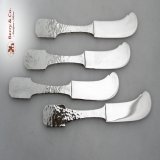 American sterling silver Arts And Crafts set of 4 flat handle butter knives in the Norman Hammered pattern by Shreve & Co, 1909. These handsome knives are 6 1/8" long and weigh a total of 122 grams or 4 ozs Troy. The soft, warm, original finish is present, with no buffing or machine polishing. American sterling silver Arts And Crafts sterling large salad serving set by Arthur Stone, marked B, for Edward Billings - Chaser, Designer. Chasers, finishers, and designers customarily did not use initials, but one or two pieces of the 1930s bear a "B" for Billings. The assigment of "B"s, "C"s, and "P"s can best be determined by checking the mark against the early and later groups of Stone marks. This handsome set is 11 1/2" long and weighs 222 grams or 7.1 ozs Troy. The excellent original condition and clear detail, with no monograms removals, repairs or alterations, make this an especially attractive offering. 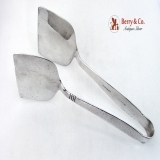 American sterling silver salad serving set hand made and hammered, marked Petersen, c.1940 - 1950. This handsome set is 9 1/8" long and weighs 223 grams or 7.2 ozs Troy. The excellent original condition and clear detail, with no monograms removals, repairs or alterations, make this an especially attractive offering. American Arts and Crafts style hand made, hammered tablespoon by Theodore Hanford Pond of Baltimore Maryland. A writer, lecturer, educator, craftsman, and museum director, Theodore Pond attended Pratt Institute from 1888 to 1892. He subsequently designed glass for Tiffany Studios, held various academic positions, including teaching at the Rhode Island School of Design, and directed the Pond Applied Arts Studios from 1911 to 1914. Core to his belief was that metalsmiths should be able to execute their pieces from beginning to end. What he did make was all done by hand, by himself. As such, his pieces are hard to find. 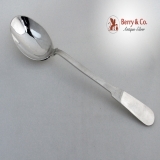 This very desirable spoon is 8 3/8" long and weighs 68 grams or 2.2 ozs. Troy. It is marked Sterling, Pond and has the KWO-NE-SHE hand wrought Dragonfly mark. KWO-NE-SHE is Chippewa for dragonfly, and was used in Longfellowâ€²s Song of Hiawatha. It retains its wonderful hammered finish and has a contemporary Arts and Crafts style monogram: LBP on the front of the handle. Monogrammed as described above, the soft, warm, original finish is present, with no buffing or machine polishing. The excellent original condition and clear detail, with no removals, repairs or alterations, make this an especially attractive offering. 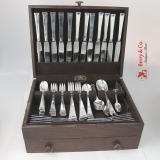 American sterling silver Art Moderne or Arts and Crafts serving or chop set, hand made and hammered for Zachoâ€²s of Los Angeles, in a pattern remarkably similar to Allan Adlerâ€²s Sunset and likely made by Adler, c.1950. It is also possible that Zacho imported his silver from his native Denmark, where he obtained his furniture and ceramics. He was a distributor and business partner with Carl Hansen and Son. Zachoâ€²s store was located at 3157 Wilshire Blvd near Bullocks. Axel Zacho was the owner and was born in Denmark in 1899, died in Los Angeles in 1955, with the store closing in 1962. There is no record of Zacho producing any silver. 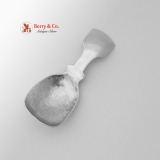 The attractive and useful spoon has a wonderful hammered finish, more pronounced on the back, and is 10 1/4" long, weighing 83 grams or 2.7 ozs. Troy. 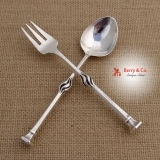 The matching fork is 10 1/4" long and weighs 81 grams or 2.7 ozs. Troy. This useful and attractive set weighs 5.4 ozs. 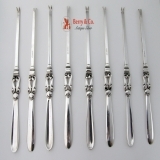 Troy, with each piece having an ornate, period script monogram on the front of the handle: B. Monogrammed as described above, the soft, warm, original finish is present, with no buffing or machine polishing. The excellent original condition and clear detail, with no removals, repairs or alterations, make this an especially attractive offering. For more on Zacho and his spectacular house at 1626 Gilcrest Drive, Beverly Hills, CLICK HERE. American sterling silver and ebony serving fork in the Town and Country pattern by Allan Adler of Los Angeles, California, c.1950. 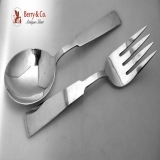 This special serving fork is 10 3/4" long and weighs 88 grams or 2.8 ozs. Troy. The soft, warm, original finish is present, with no buffing or machine polishing. The excellent original condition and clear, crisp detail, with no monograms, removals, repairs or alterations, make this an especially attractive offering. American sterling silver hand made hand hammered Arts and Crafts floral salad serving set by Marshal Fields and Company, c.1915. 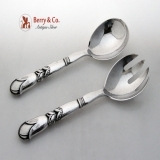 This exquisite salad serving set consists of a pattern number 4306 spoon and a 43-7 fork, both 10 1/4" long and weighing a total of 203 grams or 6.5 ozs. Troy. The excellent original condition and clear, crisp detail, with no monograms, removals, repairs or alterations, make this an especially attractive offering. The soft, warm, original finish is present, with no buffing or machine polishing.